Performing regular maintenance of household appliances will extend their life and keep them operating at maximum efficiency. Your pocket book will benefit as well with lower energy consumption, greater reliability and less appliance repairs. By following these maintenance practices you’ll reap all of these benefits. Check the door seals: A loose seal allows cool air to seep out, wasting energy and causing your fridge to work harder than it needs to. First make sure the seals are free of food residue. (Clean them about twice a year, using a toothbrush and a solution of baking soda and water.) Then try the dollar-bill test: Close the bill in the door so that half is in and half is out. If it slips out easily, you may need to have the door seals checked by a pro. Keep the coils clean: When the condenser coils are covered with dust, the refrigerator can’t run efficiently. Twice a year, pull the machine from the wall to reveal the coils in back (or snap off the grille, if the coils are on the bottom front), unplug the refrigerator, and vacuum with the brush attachment. Regular cleaning of the condenser coils every six to twelve months can improve the efficiency by as much as 30 percent. Use extra caution to avoid damaging the coils. Set the right temperature: Keep the fridge between 37 and 40 degrees Fahrenheit and the freezer at 0 degrees. Fill it up (even if you never cook and only have takeout): Refrigerators need “thermal mass” (a.k.a. lots of stuff) to maintain low temperatures. Cool foods and drinks help absorb warm air that streams in when you open the door. If you’re the eat-out type or your fridge is too big for your needs, store a few jugs of water in there. Be prepared: If the power goes out, keep the doors closed and use foods from the pantry. An unopened refrigerator will keep food safe for four hours; a freezer will maintain its temperature for 48 hours if full and 24 hours if half-full. Defrost : Manual-defrost refrigerator/freezers: When frost has accumulated on the inside walls of the freezer to a thickness of one half inch (or a little more than one centimeter) or so, remove the food from the refrigerator/freezer, turn off the thermostat or unplug the unit, and allow all of the frost to melt. Once the frost has melted completely, turn the unit back on, wait for it to reach its operating temperature, and restock it with food. 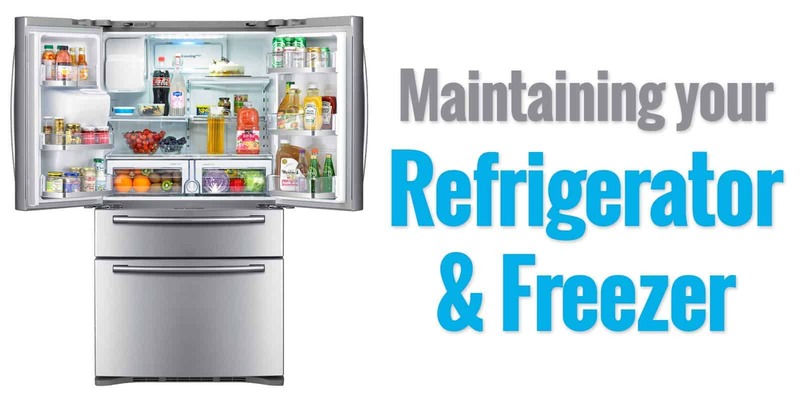 Self-defrosting refrigerator/freezers: If you have a self-defrosting refrigerator, you don’t need to do anything. Every six to eight hours, your refrigerator heats up its cooling coils slightly to melt any frost accumulation on the coils. The resulting water drains into a shallow pan at the bottom of the refrigerator/freezer. Though the water evaporates, you’ll need to periodically clean the pan to avoid odors and bacteria growth. Use warm water and a small amount of detergent to clean it out. Your owner’s manual will provide specific instructions related to this but on most models, you can access the pan by detaching the lower grill and sliding out the pan. Clean the interior: Weekly, use a cloth dampened by warm water to wipe down and remove crumbs and spills from shelves and walls. An all-purpose cleaner will make the job easier and take on stains and sticky spills without a lot of elbow grease. You can also use this cleaner on doors and handles. Use airtight containers to seal in odors and keep food fresher longer. If an item is weakly packaged (i.e. fruit cartons) or simply likely to leak (i.e. defrosting meat), place it on a plate before storing. For stainless-steel units: This cleaning solution and these wipes are specifically designed to remove dirt and fingerprint marks on stainless-steel refrigerators. While wiping, it’s best to follow the “grain” or pattern of the stainless steel. Deodorize: Freshen and remove odors with a deodorizer that’s specifically designed for refrigerators. According to the manufacturer, this deodorizer is up to 50 times more effective than baking soda for eliminating food odors. It lasts up to six months. Replace the ice maker or water dispenser water filter: Replace the water filtration system filter at least every six months.